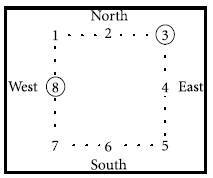 A square parking lot has exactly eight lights—numbered 1 through 8—situated along its perimeter as diagramed below. At least one of any three consecutively numbered lights is off. Neither light 2 nor light 7 is on when light 1 is on. At least one of the three lights on each side is on. If any side has exactly one of its three lights on, then that light is its center light. Two of the lights on the north side are on. Which one of the following could be a complete and accurate list of lights that are on together? Which one of the following lights must be on? If light 1 is off, which one of the following is a light that must also be off? Which one of the following statements must be true? If light 2 is on, then light 6 is off. If light 3 is on, then light 2 is on. If light 4 is on, then light 3 is off. If light 5 is off, then light 4 is on. If light 6 is off, then light 1 is on. If light 5 is on, which one of the following could be true? Light 1 is off and light 6 is off. Light 1 is on and light 7 is on. Light 2 is off and light 4 is on. Light 2 is off and light 6 is off. Light 6 is on and light 7 is on. Suppose that it is no longer part of the specifications that two lights on the north side be on. If all of the other original specifications remain the same, and if exactly one light on the north side is on, which one of the following statements could be false? 1) Which lights are on, and which are off given various circumstances? The Initial Setup: There’s nothing initially to draw; your best bet is to simply work off the picture on the page. There’s plenty of room on the bottom of the page to recreate the square when necessary. But it’s worth deciding at this point how you’re going to indicate whether a light’s on or off. A simple but effective solution is to circle a number whose light is on and put an X through a number whose light is off. 2) No reason not to jump to the simplest and most concrete rule of the bunch: Light 8 is on. Circle it. 1) This one needs some interpretation. “At least one of any three consecutively numbered lights is off.” First of all, what are consecutively numbered lights? Well, lights 1, 2, and 3, for example, or 6, 7, 8. All this rule tells us is that if any consecutive trio of lights like these are all on, that’s a violation. In other words, if lights 2 and 3, for example, are on, then 1 and 4 must be off. But wait a minute: What about the trio 7, 8, 1, or 8, 1, 2? The lights in each of these trios are physically adjacent to one another in the picture, but certainly wouldn’t be considered “consecutively numbered.” It’s a good question, but this possible slight ambiguity is taken care of by Rule 3. In the meantime, your task is to represent the rule on the page. Perhaps you came up with “NO 3 CONSECUTIVE ON” or something to that effect that will enable to you to quickly access this restriction. 3) The safest way to handle Rule 3 is to first translate it into if-then form: “IF 1 IS ON, THEN 2 IS OFF AND 7 IS OFF.” Did you work through the contrapositive? “IF 2 OR 7 OR BOTH ON, THEN 1 IS OFF.” Get both down on your page. same time, we don’t have to worry about the trios 8, 1, 2 and 7, 8, 1. We don’t think the testmakers meant for these to qualify as “consecutively numbered” trios, but Rule 3 makes the whole issue irrelevant. 4) “AT LEAST ONE ON EACH SIDE” captures the gist, although as shorthand it’s not much shorter than the original. You may have simply chosen to remember this rule, or circle it on the page. If you were unsure of the meaning, again, try out an example. Lights 5, 6, and 7, for example—the three south side lights—cannot all be off. If two of them are off, then the other one must be on. The west side, of course, automatically satisfies this rule thanks to Rule 2’s illumination of light 8. 5) This one requires care as well: If a side has exactly one light on, then it has to be the middle light. Perhaps another quick example is in order to clarify this: Light 5 cannot be the only illuminated light on the south side; that would violate this rule. Again, the shorthand is a little problematic; there’s just no really concise way to say this. Come up with some written way to express this, or commit it to memory, or circle it on the page. Here, we’ll just say “IF EX 1 ONE ON, THEN MIDDLE.” As long as you know what the rule means, you’ll be okay. 6) Finally, a rule that’s a little more specific than some of the previous ones—two northern lights are on, which means two out of the trio 1, 2, 3. And that, thankfully, leads us right to a big deduction. Did you see it? Key Deductions: Hopefully upon registering the final rule you asked yourself “which two can they be?” 1 and 2? Nope—Rule 3 forbids it. Which means we’re talking either 1 and 3, or 2 and 3. One of those pairs of northern lights must be on to satisfy Rule 6. In either case, light 3 must be on, and one of the questions, Q. 2, is answered already. Circle light 3 in your master sketch, and you’re ready to roll. Shouldn’t have had much trouble here if you used the Kaplan Method for this Acceptability question. Rule 2 is the easiest to check—light 8 must be included in any “complete and accurate” list of illuminated lights, but (A) begs to differ, and must be axed. (A) also violates Rule 3 by having lights 1 and 7 on together, and (E) violates the same rule by lighting up both 1 and 2. No good. Rule 1 gets rid of (D); 6, 7, and 8 are consecutive and therefore can’t all be on at the same time. (D) also violates Rule 6, a rule which is also not met by (B), which fails to light two lights on the north side. (You may have chucked (B) and (E) right off the bat by noticing that they don’t reflect the big deduction above, namely that 3 is always on.) The losers are chock full of violations here. (C) remains, and gets the point for Q. 1. Here’s the reward for those of you who worked out the implications of Rule 6 as we did above: Light 3 must be on because of a combination of Rules 3 and 6 (see Key Deductions above). If you’re on top of the rules, a glance at the master sketch should be enough to answer this one. Light 1 is up north, and we know something special about the northern lights—two of them must be on. If 1 is off, then 2 and 3 are on, which has a direct implication for light 4: Rule 1 insists that under these conditions, light 4 must be off. Luckily, that’s exactly what we’re looking for. If 1 is off, then 4 must be off—choice (B). (A) Correct choice (C) in acceptability Q. 1 offers us a valid collection of lights that are on: 2, 3, 5, 6, 8. Clearly, since this is acceptable, choice (A) is not—if light 2 is on, light 6 can be on, too. (B) If 3 is on (and we know by now it’s always on), must 2 be on? No; we can satisfy Rule 6 by turning on light 1 instead, which is fine as long as 7 is off. (C) Light 3 is never off. A quick kill thanks to our big deduction. 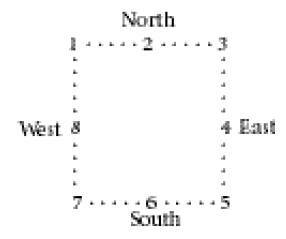 (E) is out-and-out false: If southern middle light 6 is off, then 5 and 7 must be on (Rules 4 and 5). And if 7’s on, then 1’s off, contrary to (E). You certainly may have benefited from jotting down a new sketch to incorporate Q. 5’s hypothetical—circle light 5 along with 8 and 3 and you’re ready to go. The first thing to notice is that light 4 must be off; otherwise Rule 1 is violated with 3, 4, and 5 on simultaneously. We’re looking for a choice that could be true under these circumstances, so it’s on to the choices. (B) directly contradicts Rule 3—1 and 7 can never be on together. (C) denies what we’ve just deduced, namely that 4 must be off any time 5 is on. (D) is perhaps the trickiest one to eliminate, because it forces many rules into play. But ultimately it fails, too, and here’s why: If both 2 and 6 are off, then 1 must be on (Rule 6), and 7 must be on (Rule 5). But firing up both 1 and 7 violates Rule 3, so (D) isn’t possible. (E) would create a consecutive 5, 6, 7 trio, not to mention a 6, 7, 8 trio, both of which are expressly forbidden by Rule 1. You may or may not have created a new sketch for Q. 5, but it certainly helps here to plot out the chain of deductions. A circle around light 4 demands an X through lights 2 and 5 (lest we end up with three consecutive lights illuminated). Light 1 must therefore be the other light on up north (Rule 6). And with 1 on, 7’s off, thanks to Rule 3. That leaves 6 as the only light left to illuminate the south side, and Rule 4 tells us that the south side can’t go dark. So there we have it, the entire lighting design, so to speak: 1, 3, 4, 6, and 8 on; 2, 5, and 7 off. Every choice matches up except (B). Uh-oh, they’re shaking things up. No sooner is the “two northern lights” rule lifted than we’re told that exactly one light’s on up there. No problem, we know which one it is—must be the middle one, light 2, because of Rule 5. For the first time, we get to go back on our big deduction and cross out light 3 along with light 1. We need at least one light on for the east side, and with 3 off, it’s down to 4 and 5. We’ve seen this issue before: If only the end light, light 5, were on, then Rule 5 would be violated. So at least middle light 4 must be on, and light 5 could, but need not, be on as well. The choice that could be false, therefore, is (E); maybe yes, maybe no. All of the others are definites.